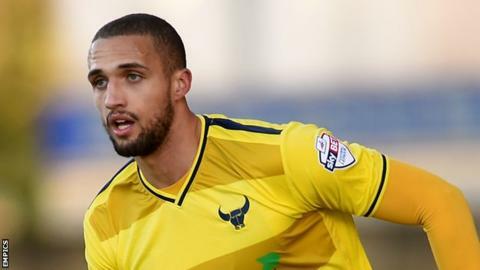 Jordan Bowery scored twice as Oxford sealed a win against Exeter to mar Paul Tisdale's 500th game in charge. Cheyenne Dunkley headed in Alexander MacDonald's cross and Bowery doubled Oxford's lead from close range. Bowery grabbed his second when he nodded home Chris Maguire's corner, and MacDonald headed in a fourth from another Maguire delivery. Alex Nicholls scored a consolation for the Grecians from outside the box after linking up with David Wheeler. Oxford stay third in the League Two table, while Exeter remain in 14th place. Match ends, Exeter City 1, Oxford United 4. Second Half ends, Exeter City 1, Oxford United 4. Delay in match John Lundstram (Oxford United) because of an injury. Attempt blocked. Alex Nicholls (Exeter City) right footed shot from outside the box is blocked. Ollie Watkins (Exeter City) wins a free kick in the defensive half. Foul by Jonjoe Kenny (Oxford United). Ryan Harley (Exeter City) wins a free kick on the right wing. Foul by Zeli Ismail (Oxford United). Corner, Exeter City. Conceded by Cheyenne Dunkley. Attempt missed. Zeli Ismail (Oxford United) left footed shot from outside the box misses to the right. Attempt missed. George Waring (Oxford United) header from very close range is close, but misses to the left following a corner. Corner, Oxford United. Conceded by Jordan Tillson. Foul by Alex Nicholls (Exeter City). Liam Sercombe (Oxford United) wins a free kick in the defensive half. David Wheeler (Exeter City) wins a free kick in the attacking half. Attempt saved. Troy Brown (Exeter City) header from the centre of the box is saved in the centre of the goal. Foul by Troy Brown (Exeter City). John Lundstram (Oxford United) wins a free kick in the defensive half. Goal! Exeter City 1, Oxford United 4. Alex Nicholls (Exeter City) right footed shot from outside the box to the bottom left corner. Assisted by David Wheeler. Substitution, Oxford United. George Waring replaces Jordan Bowery. Ollie Watkins (Exeter City) wins a free kick on the right wing. Substitution, Exeter City. Ollie Watkins replaces Lee Holmes. Foul by Jake Taylor (Exeter City). Callum O'Dowda (Oxford United) wins a free kick on the left wing. Foul by Callum O'Dowda (Oxford United). Substitution, Oxford United. Zeli Ismail replaces Alexander MacDonald. Foul by Jordan Tillson (Exeter City). (Oxford United) wins a free kick in the attacking half. Corner, Exeter City. Conceded by Jordan Evans. Alex Nicholls (Exeter City) wins a free kick in the attacking half. Foul by Chris Maguire (Oxford United). Callum O'Dowda (Oxford United) wins a free kick in the attacking half. Substitution, Oxford United. Jordan Evans replaces Joe Skarz. Goal! Exeter City 0, Oxford United 4. Alexander MacDonald (Oxford United) header from the centre of the box to the top right corner. Assisted by Chris Maguire with a cross following a corner. Corner, Oxford United. Conceded by Robert Olejnik.